Keyway#610B with DUO 'X' cut section, 14 Tumblers, Triple Bitted (DUO), 30 Grand Master Changes. DUO "M" : Consists of 14 brass disc tumblers activated by a triple bitted key to provide maximum security with a stainless steel head guide which deters drilling of the tumbler mechanism. Positive tumbler action provides smooth lock operation for years of maintenance free performance. 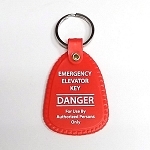 13,950 key changes available, plus master keying and grand master keying capability. DUO "B" : Consists of 14 positive action brass disc tumblers and 4 brass body guides activated by a triple bitted key. 13,950 key changes available, plus master keying and grand master keying capability. Illinois "D10" : Consists of 10 positive action brass disc tumblers and 4 die cast body guides activated by a double bitted key. For use in areas which require durability and higher than average security. 930 secure key changes available. Primary keying only. Illinois "D8" : Consists of 8 positive action brass disc tumblers and 3 die cast body guides activated by a double bitted key. For use in areas which require durability and security. 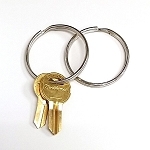 250 secure key changes available, plus master keying capability. Illinois "D6" : Consists of 6 positive action brass disc tumblers and 2 die cast body guides activated by a double bitted key. 60 key changes available. Primary keying only. Illinois "F" : Consists of 5 brass disc tumblers and 4 brass body guides activated by a single bitted key. 659 key changes available, plus master keying capability. Illinois "G" : Consists of 5 brass disc tumblers and 4 die cast body guides activated by a single bitted key. 659 key changes available, plus master keying capability. Illinois "E" : Consists of 8 positive action brass disc tumblers and 3 die cast body guides activated by a double bitted key. 250 key changes available. Primary keying only. Illinois "G4" : Consists of 4 brass disc tumblers and 3 die cast body guides activated by a single bitted key. 262 key changes available, plus master keying capability. Excalibur "Z" : Consists of 7 brass pin tumblers activated by a tubular key. 750,000 key changes available. Primary keying only.